Access Door: a closure device used for access into a grease duct for cleaning and inspection purposes. Box Hood with Make-Up Air: the hood is rectangular, box-shaped, and has Make-Up (Supply) Air vented into the front of the hood through perforated metal, so more air is diffused into a greater area of the hood. This hood comes with a light installed as well as a loose fire damper to be used in the installation. Cap: the top or bottom cover to the curb or duct. Curb: a raised or leveled metal stand used to support the exhaust or make-up air fan above the level of the roof surface. Damper: a valve or plate for controlling draft or flow of gases and air. Dry Air: air which contains no moisture or vapors. Duct: a continuous metal passageway for the transmission of air and vapors. Exhaust Only Hood: the hood has no make up air vented to it. 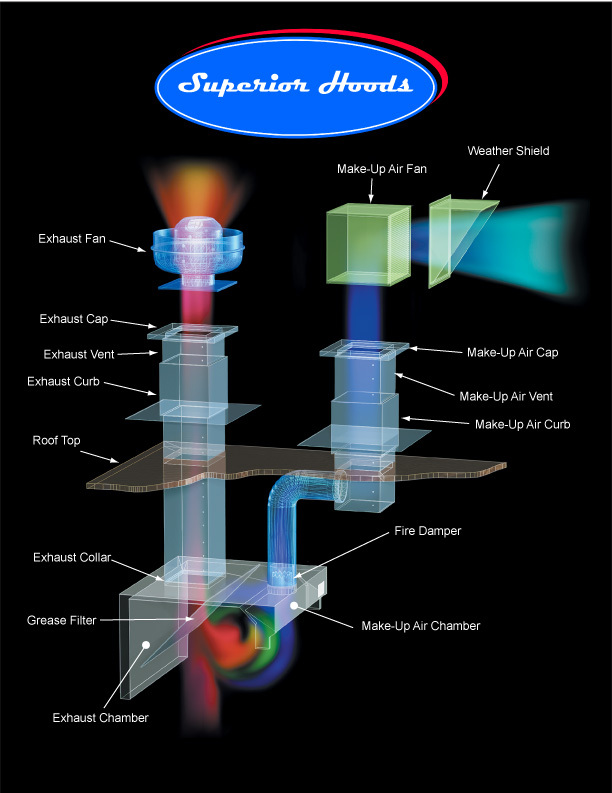 Make Up (Supply) Air is supplied by ducting to a diffuser located in the ceiling of the room with the hood. Firewrap: a fiber blanket wrapped in aluminum used as a fire proof flexible enclosure for kitchen exhaust ducts and fire rated air duct work. Grease Duct: a 16 GA, welded, liquid-tight, metal duct for the transportation of air and grease vapors, designed and installed to reduce the possibility of the accumulation of combustible condensation and the occurrence of damage if a fire occurs in the system. Grease Filter: a removable baffled metal (aluminum or stainless steel) component of the grease removal system designed to capture grease in the extracted air and direct it to a safe collection point. Heat Removal Hood: this hood is to remove and vent heat or steam only. It does not have filters nor the necessary exhaust to remove grease-laden air. To be used only for ovens and dishwashing. Hinge Kit: Hinges for attachment to the grease curb, to allow easy access to fan and duct for cleaning, inspection, and repairs. Hood: a metal device placed above a cooking appliance(s) to direct and capture grease-laden vapors and exhaust gases. Island Hood: a hood above cooking equipment that is accessible from both sides, usually in the center of a room. Make Up Air System: (or Supply Air). Outside air discharged into the room or hood to balance the air exhausted by the hood. Supply Air: same as Make Up Air. Wall Hood: a hood above cooking equipment that is installed against a wall.